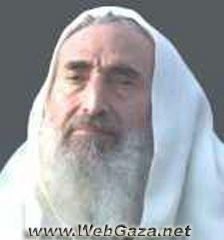 Sheik Ahmad Yassin - Who is Sheikh Ahmad Yassin? Sheikh Ahmed Ismail Yassin was born in the village of Al-Jura, Majdal district, in 1938 and sought refugee alongside his family in the nearby Gaza Strip following the 1948 Nakba or the usurpation of most of Palestine at the hands of Zionist gangs. The Sheikh was paralyzed in his youth as a result of an accident while exercising on the beaches of Gaza City. He worked as a teacher of Arabic language and Islamic religion then as a Khatib (preacher) and teacher in the Gaza mosques. He turned into one of the most vociferous and most famous Khatibs in the Gaza Strip following its occupation in 1967. He also worked as a chairman of the Islamic Complex in Gaza before his arrest in 1983 for possession of weapons, establishing a military organization and championing the annihilation of the Hebrew state. The Sheikh was court-martialed and the Israeli judges passed a 13 years prison term against him. He was released in 1985 in line with a prisoners’ exchange deal between the Zionist authorities and the Popular Front for the Liberation of Palestine – The General Command after spending 11 months in prison. The Sheikh founded the Islamic Resistance Movement, Hamas, along with a number of Islamic activists in the Gaza Strip in 1987. Zionist occupation forces broke into and ransacked his house in late August 1988 and threatened to push him along with his wheelchair across the borders into Lebanon. On the evening of 18/5/1989 the occupation authorities arrested Sheikh Ahmed Yassin along with hundreds of Hamas activists in a desperate attempt to curb the armed resistance that started to take the form of attacks on settlers and soldiers. On 16/10/1991 a Israeli army court passed a life sentence in addition to 15 years imprisonment sentence against Sheikh Ahmed Yassin after an indictment list leveled nine charges against him including inciting the kidnap and killing of Israeli soldiers and the establishment of the Hamas Movement’s security and military wings. Sheikh Ahmed Yassin, other than his complete paralysis, suffered a number of other disabilities and diseases including loss of eyesight in his right eye due to Israeli blows during interrogation in addition to weakness in his left eye. He also suffered from chronic inflammation in his ear, lung infection and other diseases in his abdomen. The detention of the Sheikh in jails further worsened his health conditions, which necessitated carrying him to hospital on numerous occasions. On 13/12/1992 a commando cell affiliated with the Qassam Brigades, military wing of Hamas, kidnapped an Israeli soldier and offered to set him free in return for the release of Sheikh Ahmed Yassin and a number of other detainees in jails including sick and elderly and Arab captives. However, the Israeli government refused the offer and stormed the house where the soldier was held leading to his death along with commander of the attacking unit and two other soldiers before the martyrdom of the three members of that cell in Bir Nabala near occupied Jerusalem. Sheikh Ahmed Yassin was released on 1/10/1997 in accordance with an agreement between Jordan and the Israel that stipulated the release of the Sheikh in return for delivering to Tel Aviv two intelligence agents, who were arrested in Jordan following an aborted assassination attempt of Khaled Mishaal, political bureau chief of the Hamas Movement. Sheikh Ahmed Yassin survived a assassination attempt on 6th September 2003 when Zionist army choppers fired missiles at a house in Gaza. He was only lightly injured in his right arm. Ahmad Yassin was assassinated in an Israeli helicopter missile strike on 21 March 2004. Israeli helicopter gunships fired missiles at Hamas' spiritual leader, Shaikh Ahmed Yassin, as he left a mosque after performing the Monday dawn prayers, killing the Hamas leader and six other worshippers. A reporter who rushed to the scene after hearing three loud explosions found the blown-up remains of Yassin's blood-soaked wheel-chair. Witnesses at the mosque said Yassin's body had been evacuated to Al-Shifa Hospital. Al-Manar TV reported that the Israeli Prime Minister, Sharon, personally supervised the assassination of Shaikh Yassin, whose death may be an attempt by Sharon to distract public attention from his personal scandals. Dr. Abdul al-Aziz Rantisi was appointed head of Hamas in the Gaza Strip following the assassination of Ahmad Yassin on 22 March 2004.